Kids and parents alike, will be hoppin' and boppin' with this fun, contemporary, positive collection of original educational entertainment - brought to you in the rich musical arrangements, easy to sing-a-long lyrics and magical vocals of the award-winning singer~songwriter, Zola. If you're ready to ride, then step inside "Zola's Jollypop Stagecoach " and take a fun-filled ride through 15 original songs that span the musical genres of pop, jazz, rock, country, blues and dance. Be a star in the musical Jollypop Show, where self-confidence soars; where you discover that you have the power to make great changes; where you can play in the snow , dance with umbrellas beneath rainbows and have sweet dreams under the moon; where you pick yourself up to go hoppin' and boppin' and dancing till dawn; where you learn about nature, recycling and more... ; where sunbeams dance on your knees as you sit under your favorite tree; where icky sticky beach sand gets in between your toes; where you meet the muddy-pawed puppy who sat on the sofa - (this is the kids' favorite song); and where all the children of the village come together to build a future that is fair, safe and strong! ZOLA is a widely known, highly sought after, children's "favorite" entertainer who continues to enchant audiences of all ages. - named "one of the best" by the Boston Parents Paper. She has written, directed and produced a number of children's musicals which have been performed both in the USA and overseas. Zola has extensive experience as a dedicated, well respected and much loved teacher of toddlers, preschoolers and elementary school children and she is the featured host of a children's video series in development where children explore the world of creative arts. 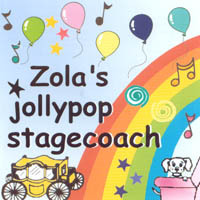 ZOLA has recorded three solo albums of original material for children, released by Jollypop? Productions in Newton, Massachusetts. These include "Jollypop Jive with Zola"(1992), "Hello Baby" - lullabies and more (1997) and "Zola's Jollypop Stagecoach" (2003). In 1995, ZOLA recorded "Letting Go", her first solo album for the adult market. In 1997, Zola made her debut as a jazz artist at Boston's reknowned jazz club, Scullers, where she received high praise from show host Ron Gill (WGBH 89.7FM). This was followed by the release of "On the Blue Side - Zola sings the Jon Seiff songbook" (2001) and her self titled CD , "Zola" (2002). Zola is also featured on a number of "BSW songwriter" compilation Cd's and on "Boston Sings Out", a jazz recording project with Boston's well known Frank Wilkins Trio. ZOLA is a Billboard® award winning songwriter whose songs have been recognized in many categories including, jazz, blues, pop and country. Her gifted talents as a singer-songwriter are clearly reflected in her pure voice, rich melodies, interesting arrangements and honest lyrics. With her crystal clear vocals, ZOLA fills every song with the passion, playfulness and honesty as true as her soul. With natural skill ZOLA creates a unique blend of musical styles that result in a performance that is all her own. "...Zola's songs reach beyond entertainment. She teaches girls and boys social skills, moral values and the importance of loving, understanding and caring for each other and the world around them. ...Zola stimulates imagination and artistry, build self confidence and fills children's minds with fresh ideas and a sense of wonder!." (Kim Storey, Ed. D. - Magicbooks Video). "Zola's songs are delightful - filled with powerfully positive messages, beautiful imagery and her simply incredible voice. Her style is both captivating and engaging . Parents are constantly raving to me about Zola's CDs, saying that no matter how often they play her music, they NEVER tire of it......"
Ron Gill ( Jazz DJ-WGBH Radio, 89.7 FM BOSTON). This is the most sing-alongable CD one could ever have in one's car on a long journey. Everyone will be clapping, tapping and singing. In fact when Spot jumps on the SOFA you'll be coaxing him off with a tune.